We baptize individuals who have made a commitment to God. They have turned from a commitment to self and have chosen to live in service and obedience to God. 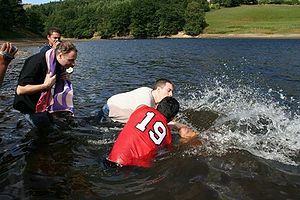 Baptism is an outward picture to the church as to what has happened within the inner spirit of the person. To immerse one under water is symbolic of death and burial to an old way of life. To come forth from the water is symbolic of the new way of life discovered in the Lord God. Our next baptism at WGBC is on the first Sunday of November, 2010.